On Academic Salon about rule of law and development of law school of PKU——“Arising,redress and precaution of false and mishandled cases in the United States” held successfully in Room 307, KoGuan Building, Peking University. The speaker of this salon is Ronald Sullivan Jr. who is the professor of Harvard Law School and Barry Scheck who is the professor of Cardozo School of Law. Dean of Peking University Law School Zhang Shouwen, vice dean Xue Jun, many of professors Peking University Law School and doctoral students showed up. 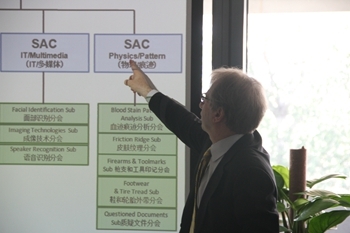 Professor Xue Jun hosted the salon. Later, teachers participating in the salon had a spirited debate about the problems of false and mishandled cases. professor Barry Scheck and professors Peking University Law School also took active in the discussion. Teachers and students expressed their opinion and came up with some questions. Then professor Barry Scheck answered them. The salon ended up with heated atmosphere.The discussion in the salon offered significant ideas and directions for the study about Chinese false and mishandled cases ,which is beneficial to promoting institutional reform in China and reducing false and mishandled cases .Finally ,it will perfect the socialist legal system and guarantee human rights.